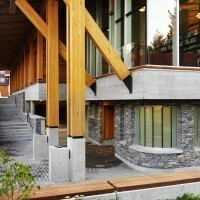 HCMA Architecture + Design designed the Whistler Public Library in Whistler, BC, Canada. 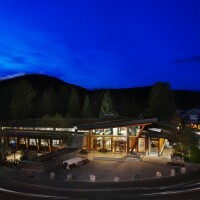 Reinterpreting the existing Whistler architecture, which is often characterized by overly expressed connection details and faux alpine pastiche, the design intent for the library was to create a crafted response to site conditions and the imperatives of alpine architecture by using local natural materials, contemporary wood detailing, and a formal building response to improve energy efficiency. 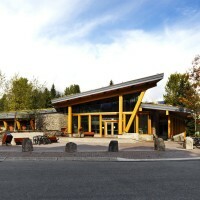 Located between the largest park in Whistler Village and a vital pedestrian promenade called the Village Stroll, the Whistler Public Library is a project that celebrates a community’s passion for the outdoors and the creative and intellectual pursuits of locals and visitors alike. From the project’s beginning, the 15,000 sq. 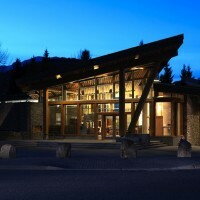 ft. library aspired to connect the sense of imagination, contemplation and community found in the world of books with the inspiration created by the surrounding mountain tops and adjacent forest glades. 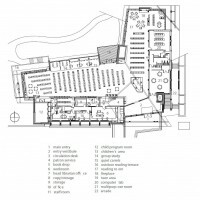 The library’s L-shaped plan allows multiple connections to contrasting site conditions. 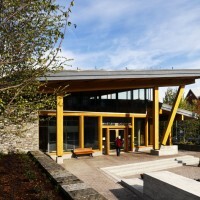 On the north side of the site is Village Park which contains a children’s reading circle, pedestrian walkways, biking/skiing greenways and a stream for stormwater management. 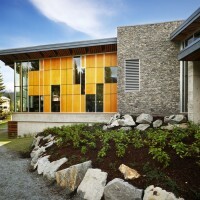 Adjacent to the park, the elevations on the north and west of the library provide an expansive curtain wall glazing system that optimizes visual connections to Sprott Mountain in the distance and to Village Park in the foreground. To emphasize this relationship, the vertical window mullions are staggered randomly to abstract the rhythm of the tree trunks in the adjacent park and to draw the eye upward toward the views. 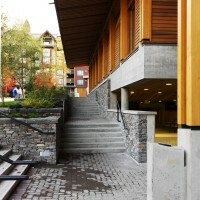 In juxtaposition to the park elevations, the south and east elevations on Main Street use pedestrian arcades, long overhangs, rhythms of doubled up glulam columns punctuated with wood windows and infill wood panels to connect to the meandering and intimate architecture of the Whistler Village. 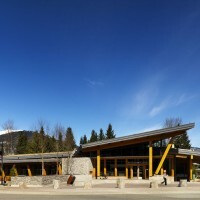 To enhance these links to the social life and outdoor activities of Whistler, the building is oriented to create a civic plaza that links the building to the Village Stroll and provides a sense of prospect over the park to the north. 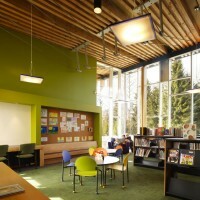 From the book lined walls of St. Jerome’s study to the soaring computer lined sections of the Seattle Library, library typology is continually changing and adapting to differing social conditions and technologies. For this library, there was a desire to provide the flexibility that new media and technologies require but to also carefully consider the relationship between a reader and a book. 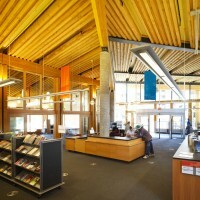 The Reading Room is located in the north arm of the grand library space but is provided with access to bright west sunlight suitable for repose on a cold winter’s day. 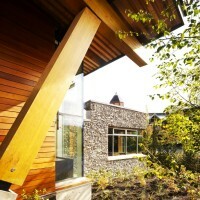 This wall is a composition of 40% glazing and 60% insulated wood panels that reduces solar heat gain in the summer. 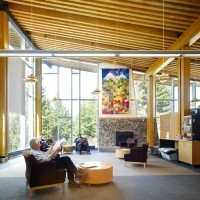 This design strategy also allows patrons to choose a sunny or shady location for their comfortable reading chair and provides a variety of framed views at different scales. 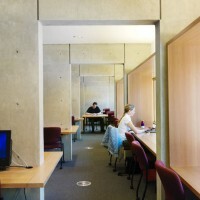 Similarly, but on a more intimate scale, the ceiling of the carrels along the north elevation is dropped down and an enfilade of concrete walls creates a cloistered atmosphere for those wishing to study quietly. Within this space, the millwork carrels are integrated into the wood window frames so that one feels that they are in their own space on the threshold between inside and outside. A large multipurpose room adjacent to the entry vestibule can be utilized for lectures, artist talks or community events even after regular library hours offers a space for ideas and discussion characteristic of traditional library spaces. 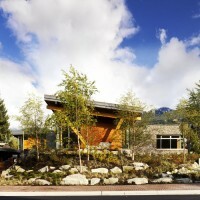 The form of the building references the drama of the jagged mountaintops circling Whistler but also uses notions of sustainability to inform the design. The high summer sun which brings unwanted heat gain is mitigated by the placement of the “back of house” volume with large overhangs and smaller punched window openings on the south side of the building. 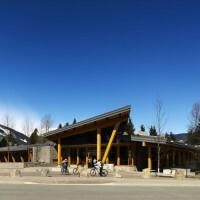 A small clerestory band over this volume accommodates for low winter sun into the main space of Library while allowing for cross ventilation and views for skiers to the top of Whistler Mountain. 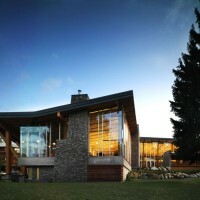 On the north elevation, the upwardly sloping roof accommodates a large high performance curtain wall glazing system that maximizes the even north light that is most desirable for reading and glare reduction on computer screens. Spatially, the result is a building that opens up in plan and section creating dramatic variations in daylighting from season to season and revealing unfolding views of the landscape beyond. 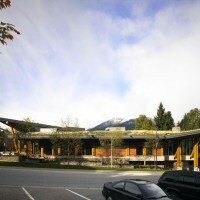 From the outset, the brief for the Whistler Public Library was clear that the building design was to promote the community’s sustainable development ambitions in a visually apparent manner. 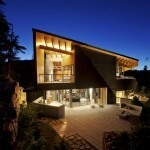 The most dramatic green strategy utilized in the project is the laminated hemlock roof system. 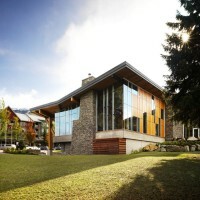 This assembly acknowledges the tradition of craft evolving in Whistler and draws inspiration from the vernacular architectural language of Whistler. 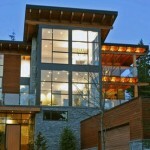 Hemlock is a highly accessible and readily available wood species that is currently under-utilized in wood construction. 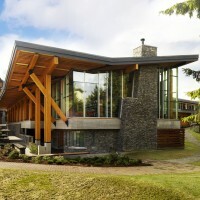 It is superior to cedar and fir from a sustainability perspective because it is often second growth lumber that does not require lengthy transportation to market. The design team developed a panel system of staggered and laminated 4”x12”’s that were simply fabricated without the use of glue into 4’ wide panels and cut to length as required. The laminations are staggered 3” which increases the effective depth of the beam to span long distances under heavy roof loading from a green roof and very high snow loads. The result of using these panels is that the structural zone is reduced substantially from a traditional decking/purlin/beam system. Architecturally, the panels also become an elegant yet robust ceiling expression that reduces acoustic reverberation and reinforces the idea of inside/outside connection by extending out over the glazing and wall systems to become continuous soffits and overhangs. 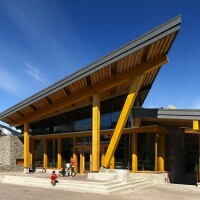 The form of the library opens up to the light and views of the mountains to the north. 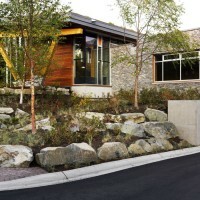 The visual connections are enhanced by physical connections to the landscape including an accessible pedestrian path that links through to an outdoor reading circle used for children’s story time and a creek used to manage stormwater run-off. On the west and north are two outdoor reading terraces that can be used during the later hours of summer sun. 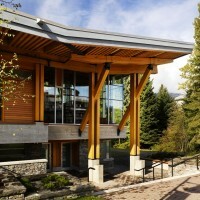 To the south, the main entry to the library is located so that building is visible from the Village Stroll and an arcade is provided to protect patrons during inclement weather. Taking advantage of grade changes a bike/skiing end of trip shower and change facility is tucked into the northeast corner adjacent to the park. 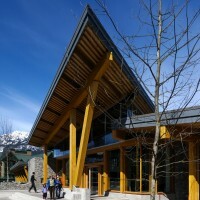 A south facing civic plaza connects through to the Village Stroll and becomes an important civic space for the community. Intimate scaled quiet carrals are carved out of the main grand space of the library. A cloistered contemplative space is provided with millwork and wood windows integrated in arrangements that allow for silent study or small group work. The opening windows provide soft north light ideal for reading. Variations of light and shade over the course of the day combined with compressions and expansions of volume, enhance the experience of the building. 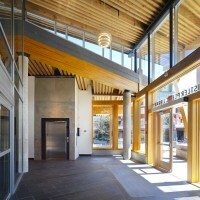 In winter, a band of clerestory glazing on the south tapers gently to the west allowing direct sun deep into the building, and drawing young patrons through the building to the children’s area. 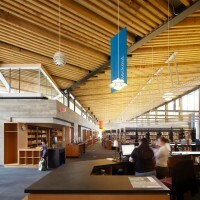 In summer, a roof overhang and light shelf on the south combine to bounce light into the space reducing summer heat gain but also bringing in even light conducive to library activities. 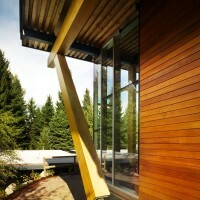 The shallow structural zone provided by the laminated wood roof maximizes the size of the north facing glazing. 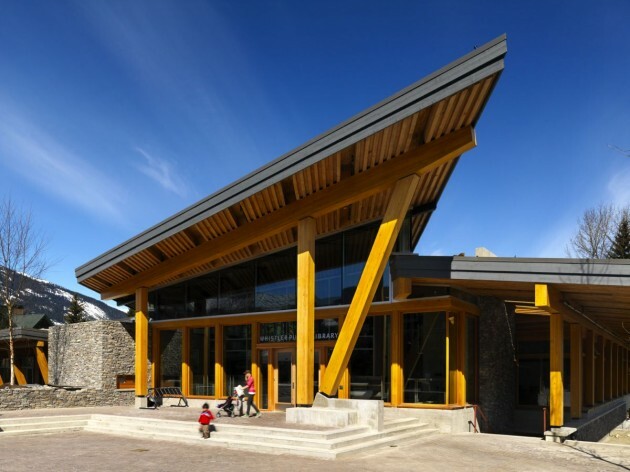 Whistler Library is anticipated to receive a LEED Gold Rating by incorporating a wide array of sustainable design principles. 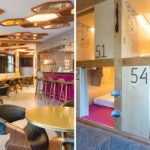 A cycling and skiing end-of-trip facility has been provided with showers and lockers to encourage people to use alternate transport. 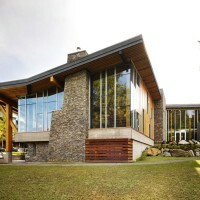 In addition to the siting principles undertaken to reduce solar heat gain, energy efficiency of the building is improved by utilizing ground source heat exchange, displacement heating and cooling (through a raised access floor), high efficiency boilers, and DDC (Direct Digital Control) systems to control opening windows and mechanical systems. 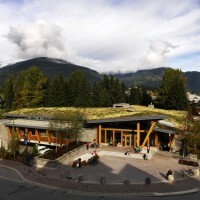 Finally, a green roof to reduce stormwater and maintain snow on the roof for increased insulation acts as a visual symbol of the community’s sustainability goals and approach to a re-invented mountain architecture. 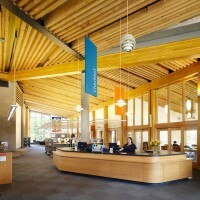 The library plan is informed by the particular space requirements of the program in both plan and section. The servant spaces of the back of house and children’s program room are in a low bar along the south elevation with standard ceiling heights. 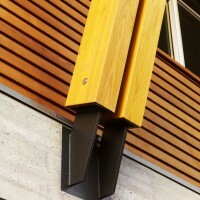 This bar is represented as a wood bridge with heavy masonry and concrete anchoring elements. 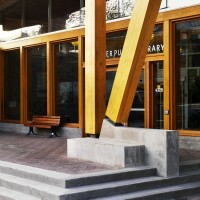 The entry vestibule, multipurpose room and washroom blocks have the ability to be isolated from the main space of the library so that they can be used for artist talks, slide shows and other community events when the library is closed. 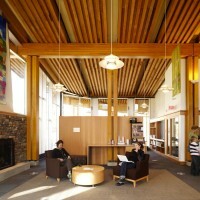 The main space of library with its soaring exposed ceiling is zoned according to noise levels with the reading room and children’s area’s located at the bookends. In between, the quiet carrels are located in an intimate space of contemplation with views to the forest and mountains beyond. 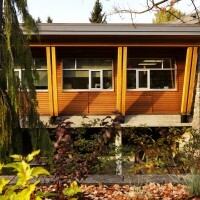 The combined load from the green roof and heavy snow loads of Whistler is a substantial 220 lbs/sq.ft. (10.4 kpa). In a typical wood structure based on a deck, purlin and beam assembly these loads would have resulted in an extremely deep structural zone thereby increasing the height of the building and corresponding exterior wall assembly in order to achieve the desired light and views. The laminated system allows for a shallow structural zone reducing exterior cladding quantities and maximizing light and views. In between the panels is a 12” (300mm) space has been left to run services such as sprinklers and lighting conduit and provides some visual relief while maintaining the impression of a clean blanket of wood overhead. 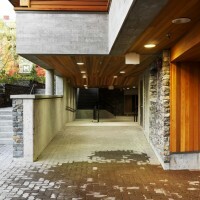 Responding to the extremely high snow loads found in Whistler, the vernacular architecture of the area is characterized by the extensive use of heavy timber construction. 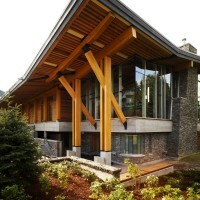 This project draws upon this tradition but also applies a more contemporary design language by utilizing refined pin connections,hidden knifeplate connections and 19mm reveals between glulam column and beams connections to create a sense of lightness in the support of the laminated wood roof. 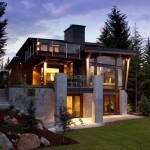 Visit the website of HCMA Architecture + Design – here.